I wrote this as my stepdaughter and her boyfriend were cooking food for her work lunches. I guess that’s why I had food on the brain! This will be my last OWS post. Today I’m headed in the other direction, to Central Park to meet my editor. I hope to write that experience up for Thursday, but our plane leaves early Thursday morning, so I may not be back until Friday — to share more fiction. 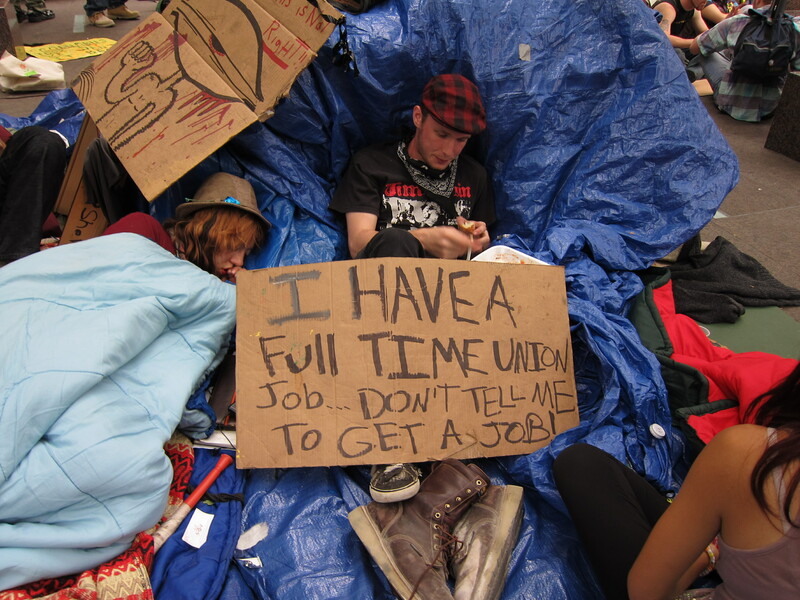 Speaking of fiction, there’s more being reported about Occupy Wall Street. Below are more reflections on my experience as of yesterday. I do not speak for OWS, but only for myself. 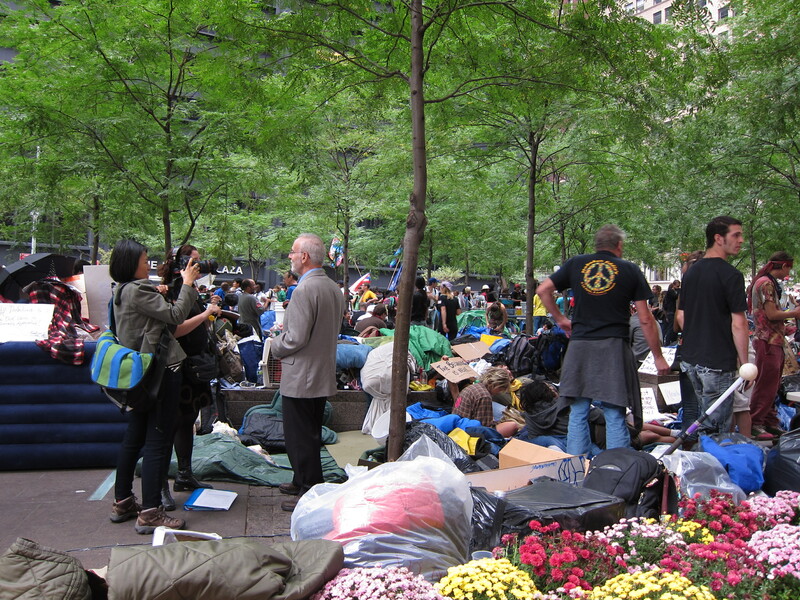 The observations that follow are formed from my visits to OWS and reflect my personal thoughts. I’m a lover of slow food. We buy organic, avoid processed foods, and enjoy savoring our meals. We believe that good things are worth preparing and waiting for. The anticipation, the scents wafting from the kitchen, and relaxing conversation after the meal are all important to us. Contrast this with our instant gratification society: eat from a box or from a restaurant as fast as possible, sometimes in the car, sometimes standing up, and — well, you get the picture. In this scenario, we never notice the bites we take or get the pleasure of a beautiful meal. What does this have to do with Occupy Wall Street? I belong to a women’s writing group, She Writes, and specifically the Blooming Late group. Yesterday’s blog post stirred up the group when one of the members asked, “What do they want?” Since we’re a passionate group, a spirited debate ensued. It’s a valid question, and one asked frequently by the media and others. For some, “What do they want?” will determine whether or not to join the movement. These people have real concerns about what’s happening but don’t want to discover down the road that they’ve joined the Communist Party unintentionally. For others, “What do they want?” is a way to deride the movement by painting the protesters as being aimless and undirected. There are "shifts" of people who come when they're off work. Not everyone is unemployed. I can tell you what this movement does not want. It does not want violence. These are not kidnappers or terrorists. They are American citizens concerned about the direction of the country. I have met people who blew my cynicism out of the water with their sweetness and sincerity, not to mention a surprising amount of intellectual capacity. I’ve never had so many conversations with New Yorkers as I have had with the protesters, and I get up here a fair amount. This is a group that values the nonviolent civil disobedience demonstrated by Ghandhi and Dr. Martin Luther King. The protesters also do not have the authority to put people out of work, nor would they. If a Wall Street company lays off its people, it’s for the company’s own business decisions – Occupy Wall Street has nothing to do with that. So please don’t blame the upcoming Goldman Sachs layoffs on OWS. As to what they want, this is still being determined. There is no official platform at this time. No “demands” have been settled on. Here’s a good article on why that I ran across just this morning: CNN Article. It answers a question posed by some of, “What are they going to do if demands aren’t met?” And isn’t that where the fear mongerers such as Glenn Beck are having their field day, projecting mass murders in our streets? Now, for those who want to know “what they want,” but are unwilling to do the two-minute Google search to find it, here’s the link: Occupy Wall Street proposed demands. Again, please note that this is a PROPOSED list that is neither complete nor official at this time. It’s not easy to live with questions when all we want is answers, but sometimes we have to. Let’s look back in history to the beginnings of our government. The Articles of Confederation were drafted in 1777 and formally ratified in 1781. It was replaced by the Constitution in 1789. Obviously, our Founding Fathers cared enough about the nature of this new government to take their time. A lot of debate went on, and a fair amount of disagreement. The issue of slavery, the most shameful scourge of our history, took decades of work to dissolve. Even then, it took longer to create equal opportunity for minorities. The Civil Rights Act of the 1960s, a full hundred years after the Civil War, righted some wrongs…though we still deal with racism today. The point is, even where there is the most obvious need for change, change does not come easily. Solutions don’t occur overnight. Occupy Wall Street is not a box of instant potatoes. It is a burgeoning movement that is taking its time and having numerous thoughtful discussions to determine their next steps. By the way, anyone who wants to know what “they” want is allowed to participate. Have concerns? Make your own comments. This is America. You are welcome to speak. Those who asking what to “they” want would do well to ask themselves that question. What do YOU want? 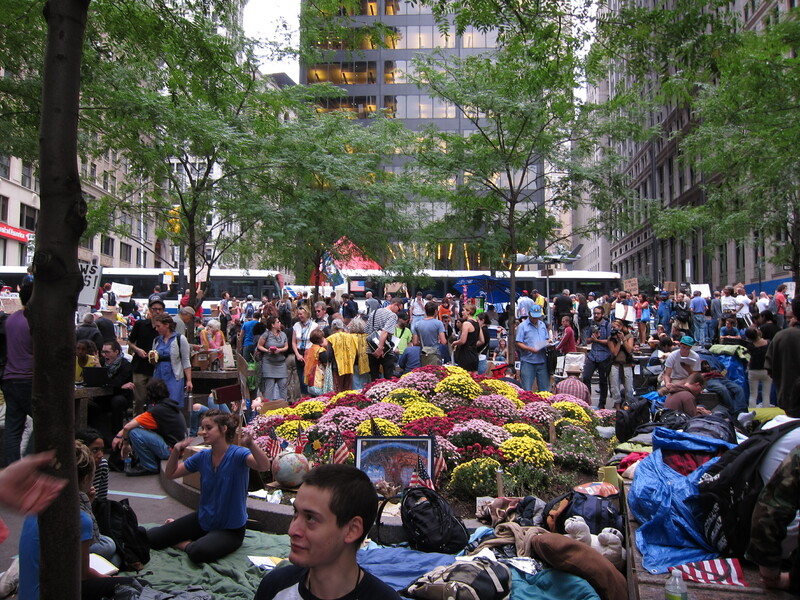 Will Occupy Wall Street determine positive solutions? I hope so. I don’t know that yet. I will evaluate my involvement step by step. I am not a Marxist, a Socialist, or any other names that get bandied about by those who are critical of the movement. I am a concerned citizen who loves my country. So are the protesters. We must take our passion to the voting booth and seek out candidates who are willing to solve the problems that face our country, and not just give lip service to them. For a movement to last, it must be willing to evolve and work for real change. Will it happen with this group? Maybe, maybe not. But even if this group does not coalesce, the American people are being forced to examine the problems and debate them. That, in and of itself, is a positive. In the meantime, I am comfortable, for now, living with the questions. A good pot of spaghetti needs to simmer for hours to reach its full flavor. A good pot of democracy needs to simmer and stew as well, with multiple points of view and ideas being sifted in to create an aroma and flavor that we can all live with. To not take the time to sort out these questions does a disservice to our country and the seriousness of the debate involved. I am proud that people are taking their time — we should all do that in our lives and with our democracy. Nadine, I appreciate your take on OWS! So many questions…so much to ponder…so much to celebrate about our democracy. Great post. Nadine another great article. From one concerned citizen to another, I think what these people are doing is admirable and wonderful. I realize they have more than one thing they are asking for, but this country has gotten so diverse and so mixed up, there is no single answer to solving the problem. I just have to laugh at Glenn Beck’s if you are rich they will grab you and kill, if you are… they will grab you and kill you. Nothing like putting the fear into people so they won’t look into what is actually going on and how these people are actually practicing ahimsa. You are so right about the simmering and stewing. Heck even when they were proposing the new constitution, Jay, Hamilton and Madison all took their time in writing essays that would eventually become the Federalist papers. They did not just jump on the band wagon, along with the other Americans and put it into motion overnight. Thank you for the link! If only this was what was made available through common media sources. I have signed up and posted a comment there finding them more organized than commonly known and seeming to have a peaceful intent. I do hope that this turns into a positive experience for the nation allowing change relatively painlessly.